The Global Volcanism Program has no activity reports for Tunkin Depression. The Global Volcanism Program has no Weekly Reports available for Tunkin Depression. The Global Volcanism Program has no Bulletin Reports available for Tunkin Depression. The Tunkin Depression volcanic field (also known as the Tunka Depression) covers a broad area immediately west of the SW tip of Lake Baikal. The Khobok group of basaltic cinder cones near the village of Tunka, one of five groups of cinder cones characterized by some sources as late-Pleistocene to Holocene in age, has the largest concentration of vents. Drill cores show that the upper 500 m of the basin is filled with Quaternary tuffs and a dozen lava flows; subsidence continues, partially burying volcanic features. Other well-preserved cinder cones of probable Pleistocene age are located to the SE in the Khamar-Dayan Range. The youngest cinder cones and lava flows are in the NE part of the Tunkin Depression. The age of the latest eruptions has variously been considered to be Pleistocene-to-Holocene or late-Pleistocene. Hasenaka T, Litasov Y, Taniguchi H, Miyamoto T, Fujimaki H, 1999. Cenozoic volcanism in Siberia: a review. Center for Northeast Asian Studies, Tohoku Univ, no 3, p 249-272. Rasskazov S V, 1994. Magmatism related to the eastern Siberia Rift system and the geodynamics. Bull Centres Rech Explor-Prod Elf Aquitaine, 18(2): 437-452. Rasskazov S V, Kunk M J, Luhr J F, Bowring S A, Brandt I S, Brandt S B, Ivanov A V, 1996. Episodes of eruptions and composition variations of the Quaternary lavas in the Baikal Rift System (Ar-Ar and K-Ar dating of volcanism in the Dzhida River area). Russian Geol Geophys, 37(6): 1-12. The Global Volcanism Program is not aware of any Holocene eruptions from Tunkin Depression. If this volcano has had large eruptions (VEI >= 4) prior to 10,000 years ago, information might be found on the Tunkin Depression page in the LaMEVE (Large Magnitude Explosive Volcanic Eruptions) database, a part of the Volcano Global Risk Identification and Analysis Project (VOGRIPA). There is no Deformation History data available for Tunkin Depression. There is no Emissions History data available for Tunkin Depression. 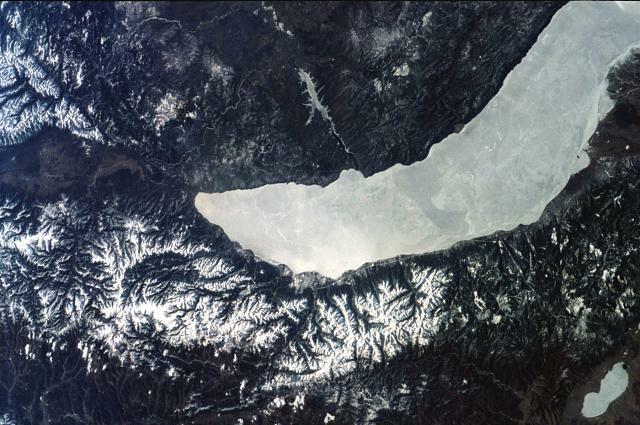 The ice-covered SW end of Lake Baikal cuts across this NASA Space Shuttle image. The snow-free lowlands west of the lake are partially occupied by the Tunkin Depression volcanic field, which covers a broad area west of the lake. The volcanic field (also known as the Tunka Depression) contains five groups of late-Pleistocene to Holocene cinder cones and lava flows, some of which are partially buried by sediments in the subsiding depression. The Angara River (top-center) flows from the NE into Lake Baikal. NASA Space Shuttle image ISS002-305-15, 2001 (http://eol.jsc.nasa.gov/). There are no samples for Tunkin Depression in the Smithsonian's NMNH Department of Mineral Sciences Rock and Ore collection. IRIS seismic stations/networks Incorporated Research Institutions for Seismology (IRIS) Data Services map showing the location of seismic stations from all available networks (permanent or temporary) within a radius of 0.18° (about 20 km at mid-latitudes) from the given location of Tunkin Depression. Users can customize a variety of filters and options in the left panel. Note that if there are no stations are known the map will default to show the entire world with a "No data matched request" error notice. Large Eruptions of Tunkin Depression Information about large Quaternary eruptions (VEI >= 4) is cataloged in the Large Magnitude Explosive Volcanic Eruptions (LaMEVE) database of the Volcano Global Risk Identification and Analysis Project (VOGRIPA).